On September 9, 1842, Adaline (Tenney) Comings, wife of William F., and mother of Emeline and Adaline Comings was found dead at the foot of her bed. Around her neck was her own handkerchief, tied in a “halter knot.” The other end of the handkerchief was tied to the bed. Her head was dangling less than three feet from the floor. Her husband William admitted that Adeline knew he had been unfaithful to her, and she was depressed. He said he had woken from a sound sleep and found her already dead. The Court of Inquest ruled that Adeline Comings had committed suicide. But even so the townspeople did not offer him jobs, and his former lover wrote to him saying their affair was over. And so, with no reason to stay in Bath, and more not to, William Comings moved to Rensselaerville, New York. He did not attempt to hide his move there. 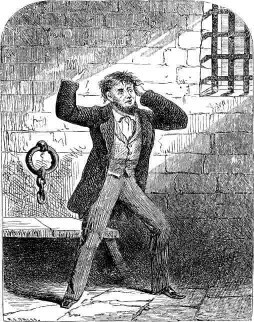 Not long after, on 21 February 1843, he was arrested there, and returned for trial in New Hampshire. In 1843 a Grand Jury at Plymouth NH indicted William Comings of strangling his wife, of hanging her with her own handkerchief, and of beating her. The country doctors called in to testify gave conflicting testimony–stating there were marks on Adaline's body, while others testified to the absence of marks or injuries. The jury eventually found Comings guilty of murder in the first degree. For the following year William Comings appealed his case unsuccessfully. In 1844 when he went before a judge for sentencing, he again claimed his innocence. He was sentenced to be hanged. At this time in New Hampshire, the continuance of the death penalty was in question. The bill to abolish capital punishment was stuck in committee. And so carrying out the death sentence was delayed. Did William Comings get away with murder? Or in a strange twist of fate, did his wife truly commit suicide in a way that implicated her husband? Samuel-5 Cummings, (John-4, John-3, John-2, Isaac-1) married 2 Oct 1741 Sarah Spalding, dau of Dea. Andrew & Abigail Spalding of Westford MA. She b. 9 June 1723. He died in Cornish NH 6 June 1796 and she died in the same town 20 Nov 1801. The two oldest children were born in Westford MA, the remaining probably in Dunstable MA. In 1773 he bought land in Cornish NH not far from the Connecticut River. He is buried in the old burying ground in Cornish NH. 7. Mary Cummings, b. 16 Dec 1757 in Dunstable MA; m. Ebenezer Fletcher. She d. 26 Feb 1812. Benjamin-6 Comings, b 28/29 March 1755; married Mary Cooper. She was born 20 July 1753 He died 13/14 Apr 1813. She d. December 1843. They resided in Cornish NH, having received from his father a gift of land in that town. 1. Peninnah Comings, b. 20 June 1777; m. 14 Dec 1800, Chester Weld. Had issue. Deacon Fenno-7 Comings, born 21 March 1787; married 22 Nov 1810 to Rebecca Smart. She was b. 26 July 1788, dau of Caleb Smart who was b 3 May 1760 in New Market NH, and Catharine Black, born 7 Oct 1762 in Meredith NH. He was of Crydon NH and he died 24 Jan 1830. She married 2nd) Jan 1833 Rev. Jonathan Kinney of Plainfield VT who died 7 May 1838. She died in Berlin VT 10 Oct 1865. Fenno Comings was a tanner and currier, who worked with his brother, Sherman Comings in Cornish NH, and Plainfield VT from after his marriage until 1815. He then continued in the same business in Berlin VT until he died. During a sickness of several months, he and his family had the sympathy of the entire community. *William Freeman-8 Comings* b. 18 Jan 1814; m. May 1835 Adaline Tenney, daughter of John and Lucinda Tenney, born May 26, 1814 of Hanover NH, who died Sept. 9, 1842. He married 2nd) 1852, Emaretta Humphrey of Croydon NH, dau of Nathaniel & Polly (Smart) Humphrey. By 1880 he was boarding in Argyle, Washington Co. NY, a widow. Florence-10 EDDY, (Emeline Perley-9 COMINGS, (William Freeman-8, Fenno-7, Benjamin-6, Samuel-5, John-4, John-3, John-2, Isaac-1), b. 23 March 1859 NY; m. Arthur L. Hewitt, he b. 24 Nov 1851 in Barre, Middlesex VT, son of Daniel and Mary H. (Wentworth) Hewitt. He was a teacher in Berlin VT, and in 1884 a member of the Vermont legislature. He was also the town clerk, and the superintendent of schools. Florence was still living in 1930 when she was living with her daughter Ethel and family. 1.?Daniel Denslow Hewitt, prob. b. between 1879-1882 in Berlin VT [b. 2 Feb 1881] [unverified, census states Florence had 5 children, Daniel may be the 5th]. 3. Harold Rupert Hewitt, b. 6 Nov 1888 Berlin VT; d. May 1973 in Montpelier, Washington Co. VT; insurance clerk for National Life Insurance Co. in Montpelier VT; he married Ruby? Dors. In 1920 living in Montpelier VT with his wife, mother-in-law Flora Dors, and brother-in-law James Dors [in that census his name is mis-transcribed as Hewett]. His WWII Registration Card shows next of kin, Irene M. Hewitt. During WWI He was inducted on 15 July 1918 in Montpelier VT, in Tank Corps June 1917, overseas 9 Aug 1919, discharged 14 Aug 1919. Boston MA; They had children: Lena M., Florence E., Esther H., Madeline. Adaline Lucinda-9 Comings/Cummings, (William Freeman-8, Fenno-7, Benjamin-6, Samuel-5, John-4, John-3, John-2, Isaac-1) b. 22 Feb 1842 in Bath NH; married 22 Nov 1860 Norman J. King, and died near Sheffield IL 19 Feb 1882. Mr. King was b 18 June 1836 in Corinth, Saratoga Co NY. He removed to Dakota 1885. In 1900 census he is living alone in Township 145/146 in Wells Co. North Dakota. He died 13 Apr 1911 in Carrington, North Dakota. He is probably the Norman King who enlisted at Horicon NY (Civil War) on 7 Aug 1862 at the age of 26 in Company D., 118th Infantry Regiment, discharged 27 June 1865 at Fort Monroe VA.
1. William Freeman “Willie” King, b. April 24, 1862 NY; possibly he is the William F. King a lumberjack found in the 1920 and 1930 census of Minnesota married to a Chippewa Indian Lizzie, and with children George, Daniel, Lizebet/Lizzie, Allen, and Malvin/Melvin. 2. Ada R. King, b. Aug 6, 1866 Scroon Lake NY and d. 1947; she m. 22 Nov 1883 in Jamestown, North Dakota to Gustav/Gustaf Willhelm Kallberg. He b. 28 Apr 1863 in Kalsvik Sweden and d. 1942. In 1910 living in Carrington, Foster Co ND with his parents Peter J. & Catherin Kallberg (no ch living with them). In 1920 living in Carrington, Foster Co. North Dakota. This entry was posted in New Hampshire Men, New Hampshire Women. Bookmark the permalink. I have a family Bible with many records of this family starting with the marriage of Emelin P. Comings (sic) to Joel S. Eddy in 1858, and later to A. E. Bailey continuing on through the Baileys and related families up to about 1917. Is there any surviving member of this branch of the family with an interest in this information? This is an offer of a gift, not an offer of sale. My Great Grandmother was Florence Hewitt , and Yes we are decendants of the Joel E Eddy & Emiline marriage. We have been involved in doing a lot of work. I would be inebted to you for a copy of the family Bible. Fantastic information and a lot of blanks filled in on the Hewitt family tree that I am working on for the Hewitt clan. Daniel Denslow Hewitt and his first wife Harriet Belle Stickney were my husband’s grandparents. Thank you!